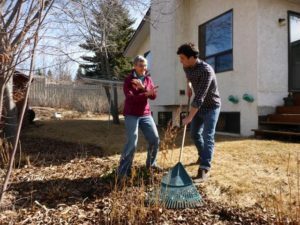 Are you wondering when is the best time to do your Spring yard clean up? And thinking that now the snow is gone you should do it now? Think again! Those leaves and debris are shelter for the beneficial ladybugs in your yard (see the one that was hiding in my leaves in the image below) and they need shelter while the nights are still cold. WHERE’S THE BEST PLACE TO START WITH YOU SPRING YARD CLEAN UP? 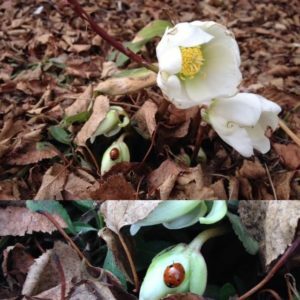 You can safely pull back the mulch a bit from around bulbs and perennials if they are starting to bloom now, like the Lenten Rose below in my yard. Once it is warmer, just remove the leaves that are covering your plants and leave the rest to compost naturally in your beds, continuing to shelter the ladybugs. That leaf litter also protects your plant roots from the extreme cold and heat we are getting in Spring. The leaf litter holds moisture in the soil too and is home to helpful soil microbes that tune up your soil as they work to decompose the leaf litter. If you are going to remove the leaves (once it is warmer), then do compost them in your own compost bin. If you do not have a compost bin, you can make leaf compost in bags – see the Leaf Compost Made Easy article in this section. Or add them to your green bin for the City to compost. Sprouting seeds indoors can lead to great excitement for the season ahead. It is an easy project that will extend your gardening season. All you need is a sunny window, a few pots, good sprouting soil and your spring seeds. Some examples of what to get started at this time of year are; tomatoes, herbs, peppers, broccoli, and a variety of greens, all to be transplanted outdoors later on. Growing a portion of your own food is so rewarding and a great way to get involved in a more ecologically friendly lifestyle! Spring is the best time to be pruning fruit-bearing trees and shrubs as they are the first to flower! Remember when pruning, it is best to take care of the three D’s first! Damaged, Diseased and Dead branches first. Always make your cut on a 45-degree angle and keep it as close to the main branch as possible or to the node is it connected too. (A clean cut will help prevent any future damage to your trees and shrubs). Then continue into thinning out areas, where branches are rubbing against each other, are not growing on a straight path or will be hanging too low (Keep in mind the weight of the fruit). This will, in turn, lead to higher fruit production as well as longevity for said plant. Whether you already have one from the previous season or not, getting set up for composting this year is a simple way to make use of food scraps, yard waste, and build great soil! To get started, choose an area to set up your bin (homemade or bought), or pile. If you pick a sunny area, it will speed up the decomposing process! Just be sure it is protected from wildlife having the ability to get in there. Next, you will want to begin collecting scraps from your kitchen and garden! You want to aim to have equal parts of “green” waste to “brown” waste ratio! Your “green” waste should include fruit and vegetable scraps, which produce lots of nitrogen. And “brown” waste can be wood shavings (keep them small so that they decompose with everything else), dry leaves and even old newspapers, which are rich in carbon and feed all the organism that is helping to break everything down. Having a balance of the two is important to obtain a healthy soil result. Lastly, you wait! Every week or two you can turn the pile to help in the process. You will end up with beautiful composted soil to add into your gardens. -DO NOT add in any dairy or animal products (even bones). This includes no oils, fats or pet waste. -Compost piles need air flow (oxygen) as well as moisture. Both are key factors in helping to break down the green and brown materials! Check on your pile every now and then to be sure it is going correctly. In Calgary, you may need to add water once in a while to keep it moist (not wet). WHEN IS THE BEST TIME TO HOOK UP YOUR RAIN BARRELS? AFTER A FEW RAINS WASH OFF YOUR ROOF. Wait to attach your rain barrels until a few spring rains have washed the loose asphalt, bird poop and other debris off your roof. then you will be getting clean rain water once you hook up your rain barrels. CLEAN YOUR EAVESTROUGHS NOW TOO. Before those rains start is a good time to get up on a ladder to clean out your eavestroughs. This will also keep debris and dirt out of your rain barrels and will help prevent eavestrough overflow. I take a garden trowel and bucket or bag up the ladder with me to deposit the debris I take out of the eavestroughs. If the eavestroughs are really dirty, I flush them with a garden hose after I scoop debris out. If not too dirty, I let the rains wash them out. WHEN IS A GOOD TIME TO OVERSEED YOUR LAWN? Once the nights are above freezing temperatures is the time to overseed your lawn in Spring. then the seedlings will not freeze once they germinate. See our thorough how-to overseed article in this section.